Did you know that 69% of adults have lost at least one tooth, and 50 million Americans have actually lost all of their teeth? When you lose teeth, your oral health diminishes and your confidence suffers. Dentures and partials allow patients to eat the foods they like, speak with self-assurance, and improve their overall wellbeing. Dr. Pate will suggest partial or full dentures based on the number of teeth you need to replace. 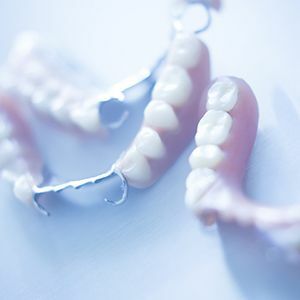 Partial dentures will work like puzzle pieces to fill in the gaps for one or more missing teeth on either arch, while full dentures replace a full set of teeth on the upper or lower jaw. After receiving your dentures, you’ll be asked to visit us periodically so that Dr. Pate can make minor adjustments that will ensure your lasting comfort. We look forward to meeting you and rebuilding your smile! Call our dental office today to schedule a consultation appointment with Dr. Pate to discuss dentures and partials. Located in Buckhead, we welcome patients from Sandy Springs, Brookhaven, Lenox, and the surrounding areas.